Beautiful early 19th century map of Asia. 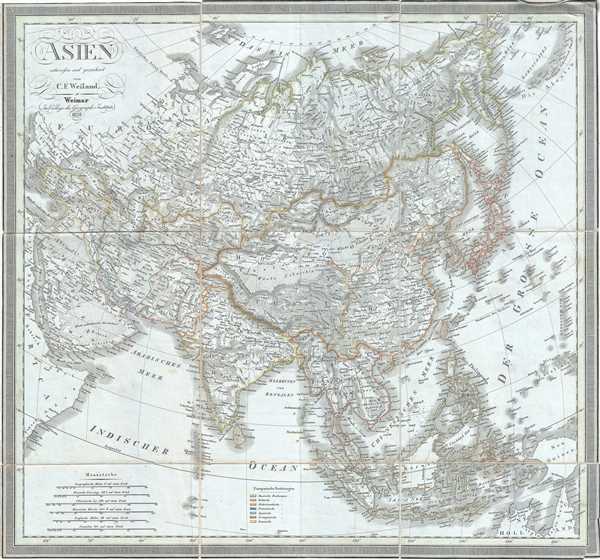 This is a scarce separate-issue 1828 map of Asia by C. F. Weiland. It covers the entire Asian continent from the Arctic Ocean to the Indian Ocean and from the Red Sea to New Guinea. Important cities, rivers, mountains, deserts, islands and various other important topographical features are noted. The sea between Asia and Japan, whose name is a matter of political debate (either the 'Sea of Korea,' 'Sea of Japan') is here settled in favor of Japan. This map was created by C. F. Weiland and published by the Weimar Geographical Institute.